HOLD'EM PREMIUM HIGH-QUALITY MENS SOLID AND STRIPES SUSPENDERS PERFECT LOOK FOR ANY TYPE OF OCCASION! Do you find yourself with pants falling down? Rather than cheap junky would you like a professional quality set of suspenders that dresses up any type of outfit for any occasion and lets you perform any type of movement without your pants should fall down? If so, you had made the perfect choice when buying Hold'Em Suspenders Perfect for any type of occasion giving you the perfect High-End class look. Choose your perfect color to match each pant you own. Perfect for wedding, tuxedos, work attire, business meeting, school uniform, school functions like choir, orchestra, dance group or any other type of special event or for your everyday use. - Made In USA; China Quality can't beat with the USA this is why Hold'Em products are manufactured in the USA. - Great for all types of ages from Elderly Teens to Men's. Also, perfect for women. - Highest Quality Elastic and Leather Button Tabs. So, if you would like an ever-lasting durable set of suspenders with High-Quality Leather Tabs, Ultra Soft Elastic for long-lasting use our Suspender are the perfect choice. 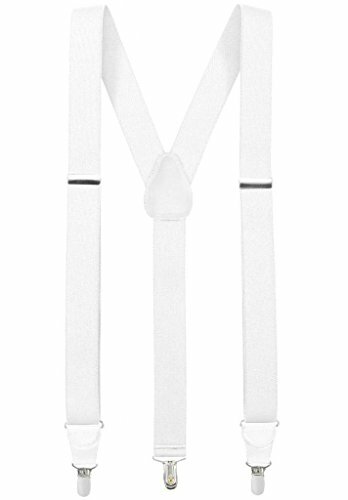 Click '" Add to Cart" to buy it now and enjoy a Lifetime Classy Suspender! SIZING; 1 ¼" wide 100% woven elastic polyester, available in two sizes, Regular - adjustable up to 46"; Tall - adjustable up to 54"
If you have any questions about this product by Hold'Em, contact us by completing and submitting the form below. If you are looking for a specif part number, please include it with your message.